Those blue eyes that look into your soul can melt the heart. With there adorable little clown faces, with matching stockings and long thin tail portray such elegance. Hard to correct that much cuteness. Holly enjoying the heat from a warm stove. A number of the cats I have had like to get up on the stove, especially if I had something yummy cooking in the oven. What a great vantage point to keep an eye on what was being served for dinner. The two Siamese I have now don't get up on the counter. Maggie used to but now that she is blind that adventure has been given up for the more verbal expression of what's cooking. She meows very loudly now and is like the partially deaf person that has to yell so everyone can hear them. Fun For Your Babies - They are your babies right? Don't know what we had stacked the boxes for but definitely had a purpose at the time. Turned our backs on the cats and they took up residence inside. Anything new in the house was fair game. Surely that is what it was put there for right? Holly is in the top box and Andy was in the bottom. Holly is a blue point Siamese. Andy is a seal point Siamese. 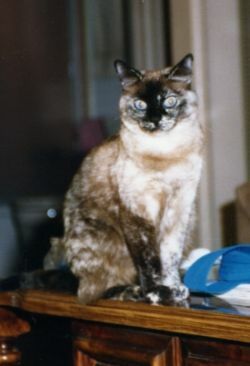 Freckles had a Siamese mother and a Siamese/Persian mix father. She ended up with some very unusual markings, although most of her was true to her point color. Her left front leg was quite spotted and her ears were slightly spotted. She had a few spotted areas by her mouth and her coated ended up being quite colorful. She was definitely a hit at the cat shows and won many ribbons in the Household Pet Category. Have a sweet personality and unusual coloring and one can do quite well in that category at shows. Do you have any blue eyed cats? Yes, I have a blue eyed cat (or cats). No, I do not have any blue eyed cats. 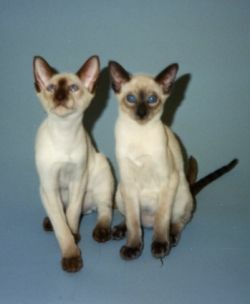 Hershey on the left is a chocolate point Siamese. 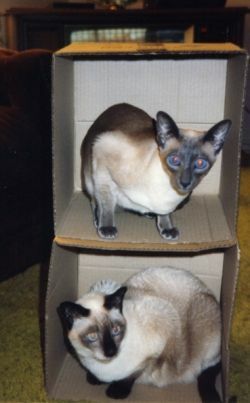 Holly on the right is a blue point Siamese. Andy is at the back on the left. Holly is at the back on the right. Rascal (female) is in front. 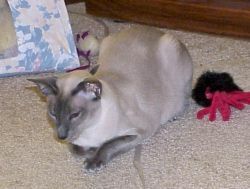 Molly is a blue point Siamese. She was 2 1/2 years old when we got her. We had to find a companion cat for Maggie as she was distraught when Minnie died. After over a month and she was still crying and loosing weight, we just had to do something. Maggie was not thrilled with the addition of Molly and Molly was not at all happy about her new home. 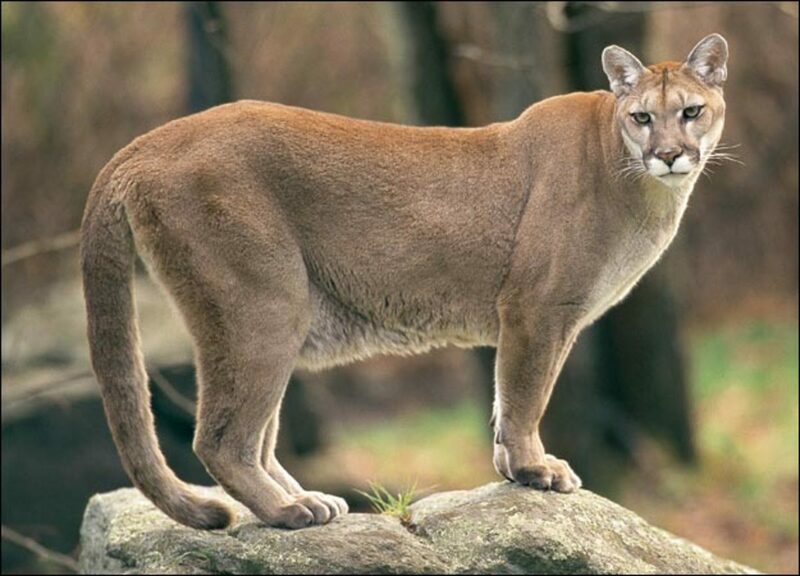 But Maggie was now spending time hissing and getting quite aggravated with the intrusion, which got her mind off of her loss she soon started to eat. Molly took to Maggie before she ever became friends with me. It has been 5 1/2 years now, but she has come with her own baggage of being her own cat. If she needs help I get one shot at helping her, otherwise she is off and gone. It is a shame she has issues. But I really love that cat. It took her about a month before I could touch her and it was months before I ever heard her purr. Actually didn't think she could purr. Now I just have to talk to her and she starts purring and she loves to carry on a conversation with me. She never said anything for about the first 4 months. Now she is such a love. So glad I stuck with trying to win her over. The first week I thought about taking her back to the breeder as she was so freaked out it was crazy. Christmas was never a dull moment at our house ever since we acquired cats. All the festivities brought the kitten out in everyone of them no matter how old they were. Maybe it was that curiosity of 'what you got in the box' attitude but there they . This is Maggie's story. It all started back in June 18, 1997 when she entered the world at the Luin Cattery. Siamese are born white and she was no exception. We first met her when she was about 7 weeks old. She was all over us and we were delighted . 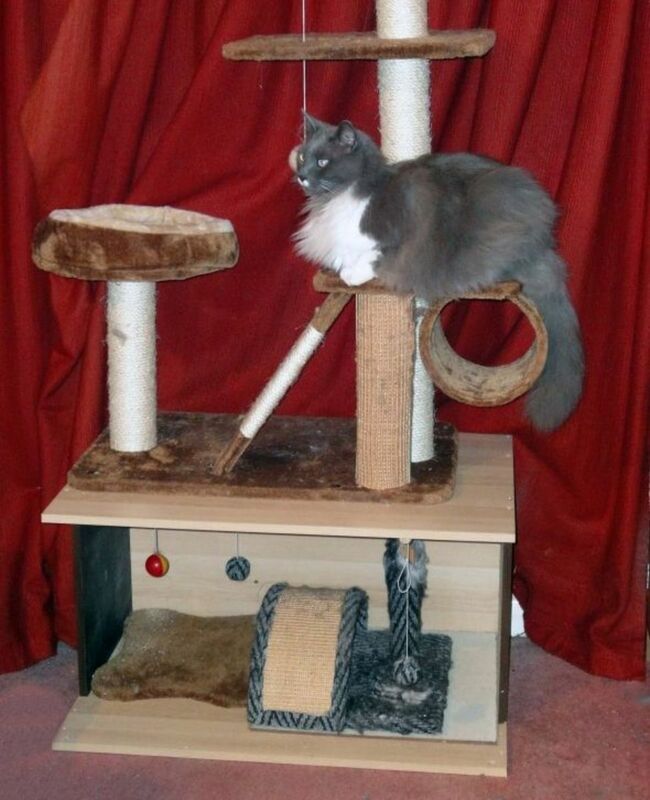 Cozy Beds For That Special Feline - You know they are going to love you for it! One of K&amp;H's most popular pet beds, the Thermo-Kitty Bed is ideal for any pet that likes to curl up and feel secure and surrounded by a bolster. Don't let the name fool you, your small puppy dog will love it too! With a dual thermostat 4-watt heating unit buried deep within its thick, super soft, orthopedic foam base, your cat will be purring all night long. Comments are Welcome! - Tell us about your cats. 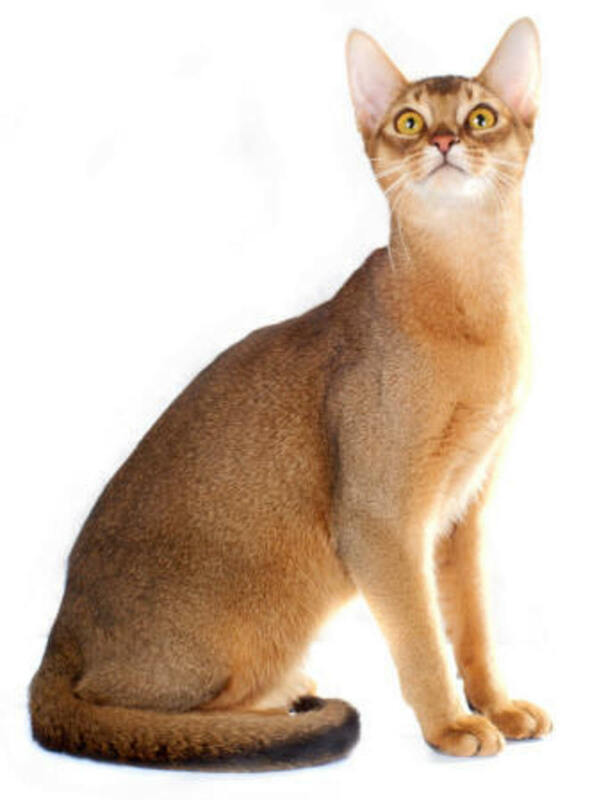 @TanoCalvenoa: Your cat is probably a mix. 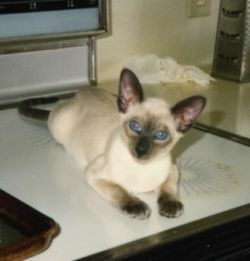 There are many that have Siamese markings. Some Siamese are thin but the old "apple head" ones are more muscular. 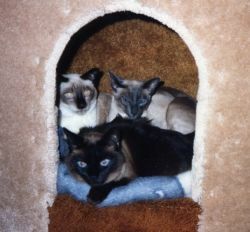 Then there is the Snowshoe, Himalayan, Birman and Burmese. So you could have one of those or a mix from that breed. My 17-year-old male cat has siamese coloration and awesome blue eyes, although I don't think he's siamese. Maybe partial, but he's thick and powerful whereas siamese are usually quite thin. @LynetteBell: Ah, too bad, as they are such characters. I had a friend that would not give up her Siamese per doctor's request. She ended up taking allergy shots. But that is really a lot of devotion and it is better not to get them if one suffers with allergies. Thanks for taking the time to drop by and leave a comment. Unfortunately I'm allergic to cats and siamese seem to be the worst offenders for some reason! @BritFlorida: Thank you. Love those clown faces with their beautiful blue eyes. Lovely photographs - they are so much fun! 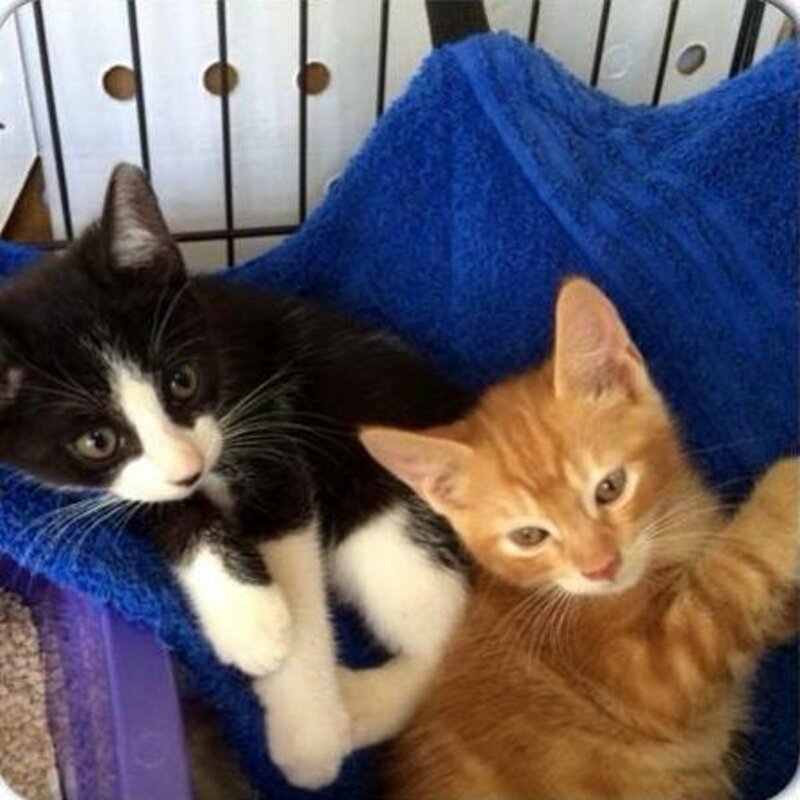 @lionmom100: Those boxes were just put down and they immediately got in them. They totally cracked me up, I just had to take a picture. What wonderful kitty faces. I love the kitties in stacked boxes. That is something mine would do. @SheGetsCreative: They are about as close to being a dog as a cat can get. They are pretty for sure. Thank you for the comment. 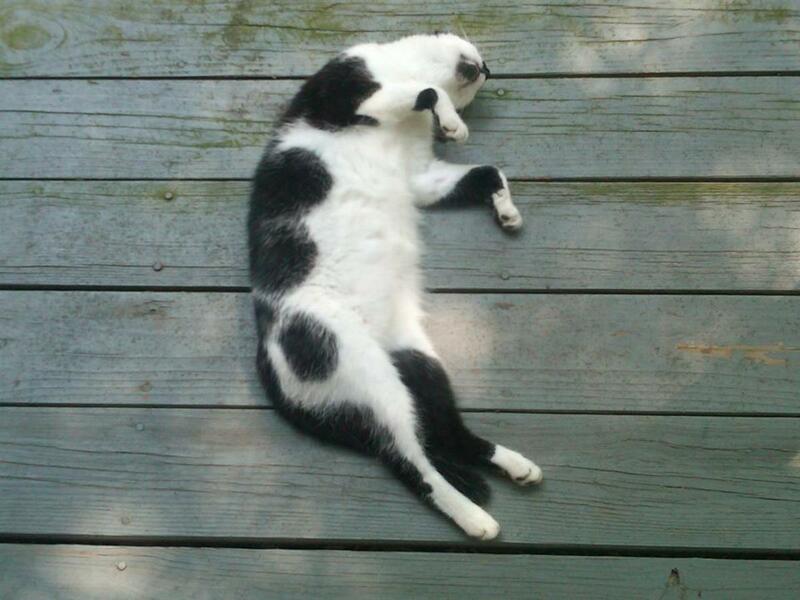 @SteveKaye: I see and I am following you along...Cats are really special. You earn their love and respect and I always admire someone that likes cats. You can't make cats like you and so one has to be gentle and caring to connect with cats. Thanks for the interest, it is much appreciated. I like cats so I'm working my way through your cat lenses. All of them are wonderful. Meow. @applejacking: Freckles had a pretty unusual coloring. The show judges were always commenting on her coat color, when I took her to cat shows. @Sylvestermouse: Thank you and those blue eyes just melt your soul and they get away with so much! Oh, they are sooooo beautiful!